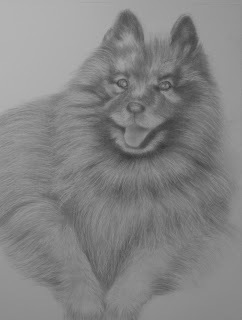 Wow, it is a good think I love drawing fur! Many layers have been added to build up the fluffiness of Smokey's fur and now I can start working on the details such as his markings and facial features. Areas of his fur also need to be worked in so that the transitions are more subtle but I had to stop as I was starting to lose sight of the dog through the fur!